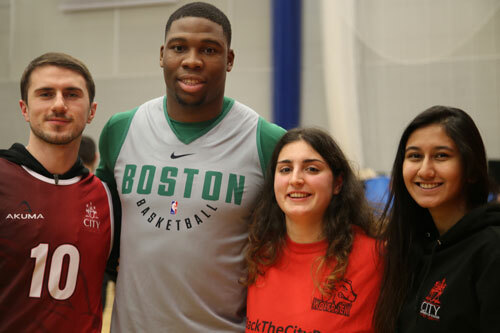 City, University of London welcomed the Boston Celtics and the Philadelphia 76ers who are preparing for their NBA London Global Game at the O2 Arena on Thursday 11th January. The two Eastern Conference rivals have spent the week training at CitySport, practicing in the basketball hall and talking with some City students. The game marked the National Basketball Association’s eighth instalment of their visit to London. The Celtics, who are currently top of the league have edged their last two games against the 76ers. Yet their opponents, who are ninth, have reasons to be positive with star player, Joel Embiid returning to form this season after suffering from a series of injuries. During their visit to London, CitySport also played host to local children and Premier League football team, Crystal Palace, in a Jr. NBA Clinic where children from the Jr. NBA Basketball England Leagues got to train and mingle with the NBA basketball and football players. Guerschon Yabusele, power forward for the Boston Celtics, said: “I like London, I was here for a bit when I was young and I have some family over here too. It is only an hour on the train from my home in Paris – it is an excellent city. Trevor Booker, power forward for the 76ers, said: “It is my first time in London, but I have always wanted to have the accent – so hopefully I can pick it up while I am here! “I am looking forward to the game on Thursday, I went to to Mexico last year, but I did not get to participate because I was traded, so hopefully I will not be traded this time and get to play abroad! Three members of the City female and male basketball teams were also in attendance, watching the Celtics train and talking to some of the players. Vlad Kolesnik, (BSC Finance, third year) and captain of the City men’s basketball team, said: “It was so exciting, I have never been this close to NBA basketball players before, even last year when I was actually in Boston. Aastha Mehta (LLB Law, first year) and co-captain of the City female basketball team, said: “It was a really cool experience to watch the Celtics, especially as they are not in London very often, so to see them up close was really nice. “It was amazing being so close to Kyrie Irving, it is much better seeing him in real life than watching on television! CitySport is the largest student sports facility in central London. This marks the second year that it has hosted the NBA teams training sessions, and it was chosen due to the high-specification of the Sports England standard sports hall.